Sea Turtles are a variety of turtles except that live in the sea, and are usually larger than the fresh water turtles. One of the largest and most well known sea turtle is the leatherback. The leatherback turtles have often been called the “modern dinosaurs” because they are the world’s largest reptile. The leatherback turtle, like many other sea turtles is in danger of extinction. They are in danger of extinction because so many people have been killing turtles without thinking of how it will affect their survival. Not only that, but poachers will wait till turtles lay their eggs and then steal them which drastically cuts down on the number of turtles that are able to hatch. The anatomy of Sea Turtles is very similar to that of the Turtles. They both have two different shells. 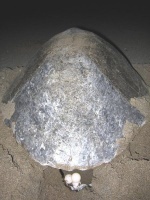 The Carapace which is on the top and the Plastron which is on the bottom; both shells are covered by scutes. Sea Turtles have beaks like birds and they don’t have any teeth. They also have four flippers two in the front and two in the back. Turtles use these flippers to swim and walk. The females also use these flippers to dig the hole in which they will lay their eggs. Sea Turtles reproduce sexually. Then the female will go unto a beach and dig a hole that is about three feet deep in which to lay her eggs. Sea Turtles usually lay between fifty to one hundred eggs, which after being buried receive no further assistance from their parent. The temperature of the eggs determines how long they take to hatch. If the temperature is around 77F it will take in between 65-70 days for the eggs to hatch. If the temperature is around 95F it will only take around 45 days to hatch. Once they have hatched the turtles will crawl through the sand to get to the water. Once in the water, they are usually safe from predators. Sea Turtles occupy marine habitats. 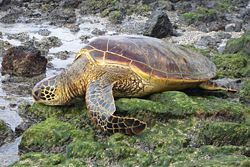 The diet of sea turtles differs for each species. For example, the Leatherback Sea Turtle eats jellyfish, while the Green Sea Turtle will eat sea grass. Sea Turtles, unlike humans, are able to drink sea water. They have been designed to get rid of all of the excess salt that is in their body. Sea Turtles are able to dive down to amazing depths. The Leatherback can dive down to 3900ft and stay down for as long as 20 minutes. This page was last modified on 1 January 2009, at 16:08.